Clocks can make a great accent in a kitchen, bathroom, bedroom or living room to keep the entire house on schedule. This collection contains several nautical and shiplap textures that would complement any coastal décor. Consider pairing these clocks with our mirrors, wall art or outdoor accents to complete your coastal home style. Wooden Clock Face Decor!Pacific Home Furniture’s Clock Face (Large) is a perfect additio..
Nautical Porthole Clock-Antique Brass The Antique B..
Nautical Porthole Clock - Antique Copper The Antique Copper Ship Porthole Clock 24"..
Nautical Porthole Clock-Brushed Nickel The Brushed ..
Nautical Porthole Clock-Chrome The Chrome Ship Porthole Clock 24" is a clas..
Nautical Porthole Clock-Antique Brass Key Features:..
ClockThis amazing Iron Clock from Pacific Home Furniture is the perfect décor for any r..
Nautical Wheel ClockPacific Home Furniture’s Antique Copper Ship Wheel Clock 15" is.. 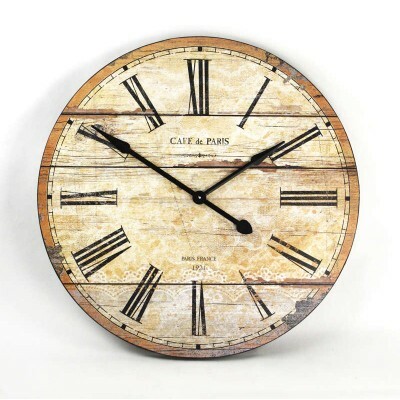 Item Name Wooden Clock Item Number PC009 Width (in.. Item Name Wooden Clock Item Number PC010 Width (in.. Wooden Clock Item Name Wooden CLock Item Number P..